This past spring, Mark decided he wanted to try a cash crop, something which required minimal care and could grow in crappy soil. Last year, we'd grown sweet potatoes in the good soil of our upper garden --- we planted them, ignored them, then harvested the beautiful tubers you see below. We were overwhelmed by the bounty and gave away perhaps a third of the harvest, then ended up not having quite enough to last us through the year. 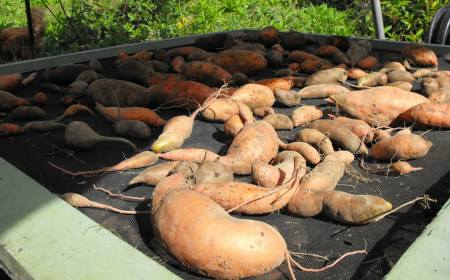 Given last year's success, sweet potatoes were an obvious choice for a cash crop this year. Mark bought $50 worth of starts and planted them in the much worse soil of the mule garden. We had so many slips that we even planted a dozen in a pure clay raised bed outside our kitchen window --- an effort which I figured was doomed to failure even though we'd been assured by our gardening friends that bad soil wouldn't be a problem. Mark watched with pleasure as the sweet potatoes twined out across the clayey mule garden soil, unfurling their heart-shaped leaves to soak up the sunlight. 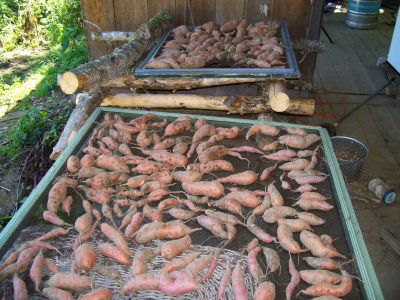 The sweet potatoes outside the kitchen window grew much more slowly, struggling to stay afloat in the pure clay, but they still managed to cover their bed and dip down over the sides. Then came the deer. First they just nibbled on a few plants at the end of the mule garden row, then they defoliated every sweet potato we'd planted (except for the ones by the kitchen window.) I rushed in with row covers and was able to cover up perhaps a fourth of the sweet potatoes, but the damage had already been done --- Mark's heart was broken. For the rest of the summer, the deer nibbled on new sweet potato leaves after every rain and Mark avoided the mule garden. Finally, with the deer encroaching more and more every day, I decided it was time to get the sweet potatoes out of the ground before the deer did it for me. The plants which had been covered by the row cover made a respectable showing, but the uncovered plants barely produced enough to make it worth my while to pull them out. All told, the mule garden rows --- which covered an area approximately five times the size of last year's sweet potato beds --- produced just about the same amount of of sweet potatoes we'd gotten last year. Mark's dreams of a cash crop were sunk. I did make him smile, though, when I finally went to dig out the pure clay bed by the kitchen window. I'd made such a point of telling him --- repeatedly --- that there was no way we'd get any sweet potatoes out of that bed. But when I slipped my fingers into the cracked clay, I pulled out the biggest tubers we'd grown this year or last, and the most of them! At least we now know that the sweet potatoes really do thrive on neglect...as long as we can get the deer to neglect them too. Sweet potatoes are started from shoots called "slips." Plant in full sun (very important!) where no animals can nibble.